This Canada/France/U.S. co-production is primarily about a down-on-his-luck small-time hood named Lou (Burt Lancaster), who dresses neatly in old clothes and fondly remembers the Atlantic City of 40 years ago. He`s now reduced to running numbers in the ghetto and living in a dilapidated apartment house just off the Boardwalk. He also acts as the companion to and occasional lover of Grace (Kate Reid), who came to Atlantic City during Second World War to compete in a Betty Grable look-alike contest. Now bedridden, she is, like Lou, a shadow of her former self. Playing opposite Burt Lancaster is Susan Sarandon, as Sally, a pretty, no-nonsense young woman who works nights at a seafood bar and during the day studies to become a casino employee. She would like to become the first female croupier in Monte Carlo. Chief among the other characters is Chrissie (Hollis McLaren), Sally`s out-of-date flower-child sister who, without warning, descends on Sally accompanied by Sally`s husband, Dave (Robert Joy), a small-town punk who had run off with Chrissie and made her pregnant. When they show up in Atlantic City, Dave is carrying a large amount of cocaine that was stolen from the Philadelphia mob. He attempts to sell the coke in Atlantic City with disastrous results. Atlantic City received five Oscar® nominations, including one for Best Picture, the first for a Canadian dramatic film. 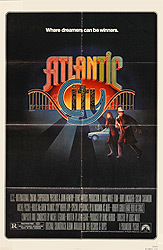 The poster for Atlantic City and the production still above were scanned from originals in The Northernstars Collection.